Why would I need self storage in Southington, CT? There are a variety of reasons why you might need self-storage in Southington, CT.
How much is a storage unit in Southington, CT? The cheapest storage unit in Southington, CT is $43.00 per month. What size storage units do you have available in Southington, CT? In Southington, CT we have sizes that range from 5'x5' to 10'x30' to suit your storage needs. How much is it for a 5'x5' storage unit in Southington, CT? The cheapest 5'x5' storage unit in Southington, CT is $43.00 per month. Southington is a small but steadily growing town in Connecticut's Hartford County, home to the villages of Plantsville, Marion and Milldale. Situated 9 miles northeast of Waterbury and 20 miles southwest of Hartford, the town has a strong mix of residential, commercial and industrial areas. It's known for its tight-knit community, cozy neighborhoods and the Southington Apple Festival. Throughout its years, Southington has been known by many names. At first it was part of the Farmington community. When Samuel Woodruff moved to the area in 1698, it was known as Panthorne. Then, in 1779, when Southington was formally established as a town, it was originally known as South Farmington. 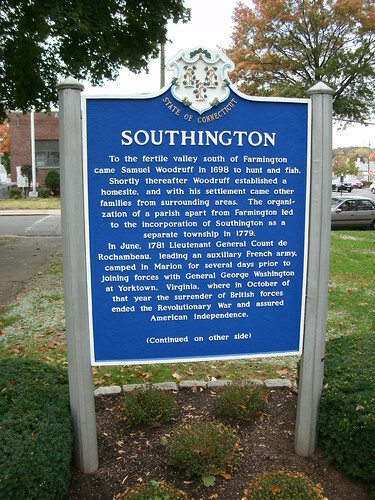 However, it eventually became known by the shortened version of its name, Southington. As the years progressed, Southington became a thriving community filled with homes, shops and taverns. One good example of architecture from those days can still be seen today at the corner of North Main and Mill streets. The large center-chimney Colonial home built in 1720 by Jonathan Root is not only famous for being the oldest home still standing in Southington but also for being a tavern General George Washington visited during the Revolutionary War. Along with homes and businesses, industry also began to thrive in the area. Atwater's gristmill was established in 1767. By 1790, Southington had sawmills, a button factory, potash works and a brass foundry. Southington was also home to the first machines to make carriage bolts. Throughout the 1800s, the city continued to grow and evolve, attracting new residents from surrounding areas. During World War II, the town found itself the center of worldwide attention when it was selected to be featured in a governmental defense booklet. The booklet was intended to demonstrate the life of everyday Americans, and was widely distributed by American military planes flying over Europe during the Nazi occupation. Despite its relatively small size, Southington has plenty to offer to occupy your free time. Shopping and dining options are plentiful, including Southington Square and Patten Brook Plaza. The town has also established a number of public parks, featuring sports fields, dog play areas and extensive green spaces. If you're more interested in the wilder side of the great outdoors, you can explore one of Southington's natural recreation areas, like Ragged Mountain. It attracts many hikers and climbers with its rocky terrain and scenic views, and is home to several rare plant species. Or you can experience the natural beauty of the Metacomet Trail; with over 60 miles of towering trees, swamp lands, lakes, waterfalls and historic sites, it is a major natural attraction in the area. Southington's Apple Harvest Festival has been a local institution since 1969, celebrating the town's flourishing apple orchards. Spanning over a week and a half, the festival features a large parade, carnival games and rides, live performances, and local dishes prepared and served by community organizations. The Southington Public School District operates the public schools throughout the town of Southington. There are a few parochial schools to choose from as well. In terms of higher education, Southington has a handful of small campuses based within its borders. Branford Hall Career Institute, Lincoln College of New England and New England Baptist College provide a variety of degree and certificate programs. Utilities: The Southington Water Department manages residential water and billing. Northeast Utilities Service Co., Kinder Morgan, Spectra Energy and Yankee Gas Services Co. are the primary energy providers in the area. Garbage and Recycling: Southington has licensed a few different waste disposal companies for private collection. You'll choose service from one of these companies, which include All Waste, HQ Dumpsters & Recycling and Waste Material Trucking. Transportation: Connecticut Transit operates several routes in and around Southington. Pets: All dogs 6 months and older must be licensed with the state, and licenses must be renewed annually. Home prices in Southington are higher than the national average but fairly reasonable considering its East Coast location. Southington's median home price is higher than the Hartford metro average, but only slightly so. Our lowest priced units in Southington, CT average $43.00 per month. 97 people have reserved units in Southington, CT in the past 30 days. There is 1 location within Southington, CT's city limits.